There has been a lot of talk about Yann Martel’s best-selling novel Life of Pi being “unfilmable.” Having read the novel myself I had always held the same assumption, but not for the obvious reason. Yes, filming a tiger and a boy on a life boat in a vast ocean might prove difficult, but I never had any doubt film technology would get there. What I did doubt was that Martel’s spiritual tale could be conveyed visually in a satisfying way. Director Ang Lee has proved me wrong to a large extent. While I feel that something was lost in the translation to film, the visual presentation is stunning, the lead performance great, and the story itself pleasing, with a few minor caveats. 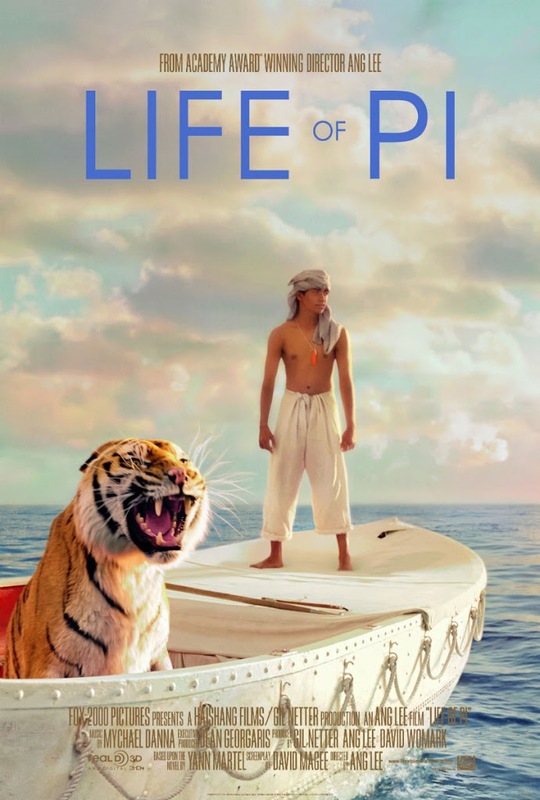 Simply put, Life of Pi is a story about a teenage boy who is trapped on a lifeboat with a tiger named Richard Parker for the better part of a year. He was stranded aboard the boat after the ship he was traveling on from India to Canada sinks. The first question one might ask is, “Why is there a tiger on the lifeboat?” The easy answer is that the ship was transporting a cargo of zoo animals across the ocean. When the ship sank, the tiger made his way to the life boat, along with Pi (Suraj Sharma). 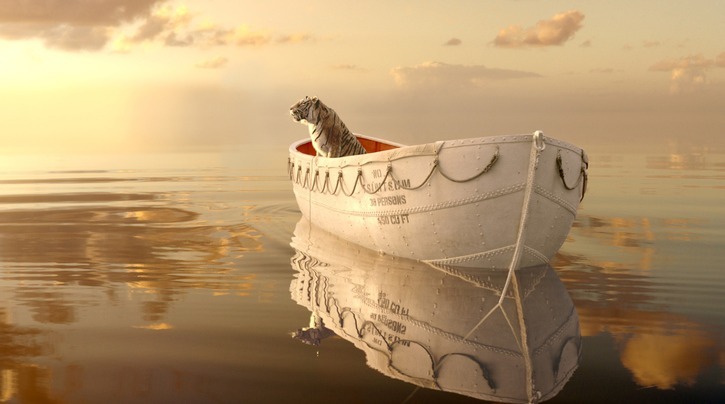 The great thing about The Life of Pi is that even when taking the story at face value, without putting a lot of thought into what everything means, it’s still an entertaining tale. It might be hard to swallow that a boy and an adult tiger could survive together for 227 days lost at sea, but it’s fun to see how they did it. There’s a lot more going on in the story than a simple tale of survival. The story is about courage, strength, and faith. Some might take it as an affirmation of faith in God (many have), but it could just as easily be taken as an affirmation of having faith in oneself. It could be interpreted as a testament to finding inner strength and the will to keep going. The story really works either way, which probably lends to its wide appeal. During the first act of the film we learn that Pi has spent his childhood practicing three different religions at the same time. Much to his father’s dismay he finds something of value in all of them, though his father tells him that believing in all religions is the same as believing in none. When the ship carrying Pi and his family sinks, his faith is tested. How can a boy, who has just lost everything he has ever known, survive alone on a small lifeboat with a hungry tiger? 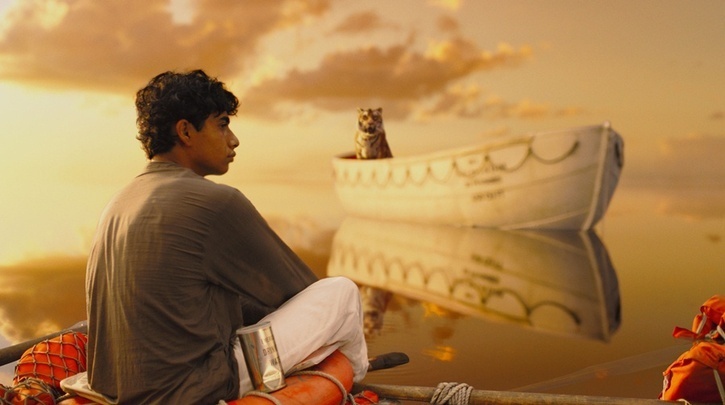 It’s best to watch (or read) Life of Pi without knowing its secrets. The film works best when the sense of wonder is intact. Knowing too much would ruin that. The film’s main weakness is actually a minor one. The framing device that sets up and ends the film is weak, not fitting the tone of the rest of the film. Because film is a more compact medium than the written word, the spiritual message feels heavy-handed. At the beginning of the film it is said that Pi’s story will make you believe in God, but the film does not actually push the story that far. While I was glad it stopped short at being overtly faith-affirming, what was there maybe didn’t have the impact they were going for. One of the strongest aspects of the film was the performance of Suraj Sharma as Pi. It’s no small feat to carry an entire film practically alone, but Sharma does it beautifully. Considering this is his first film, it’s even harder to believe he pulls off such an engaging performance. The CG effects in this film are also very good. They did a great job of capturing real animal-like movements for the tiger, particularly when he is pawing at the side of the boat or prowling around the bow. The ocean scenes also offer cool visuals. 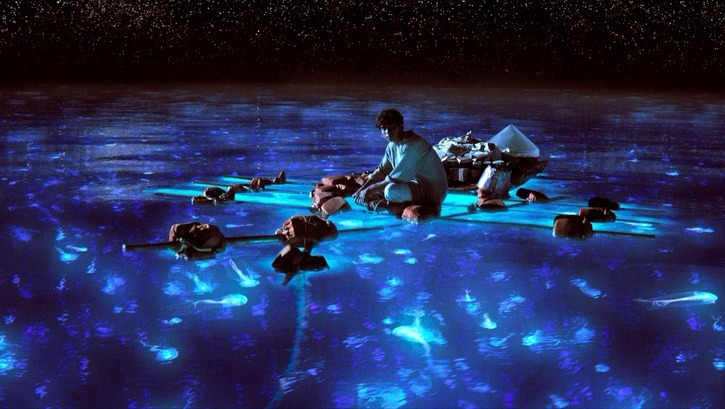 There are schools of dolphins, flying fish, and scores of glowing jellyfish decorating the oceanscape. The stylized look creates a surreal atmosphere that makes it easy to get lost in the story. Life of Pi is definitely worth checking out, especially on the big screen (though I saw it in 2D, it is also showing in 3D). The film is rated PG, which will likely draw in a lot of families during the holidays. Anyone not already familiar with the story may be surprised at the intensity of it. I wouldn’t say the book was suitable for children. Though Lee tones down some of the more graphic scenes, and cuts the zoology lesson that is such a big part of the book, the shipwreck sequence may be too much for younger children (just a word of caution). I enjoyed the movie very much. I got so caught up in it that I didn’t even eat my popcorn. I can still see scenes from it when I close my eyes. Beautiful.